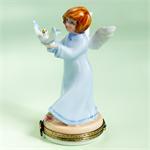 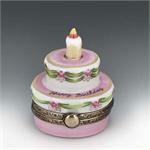 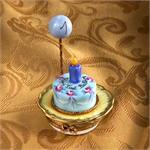 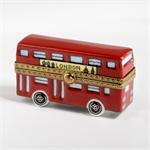 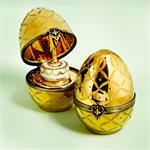 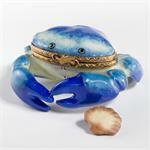 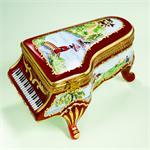 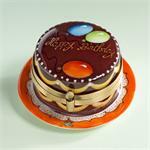 Limoges Birthday Boxes for every occasion at great prices! 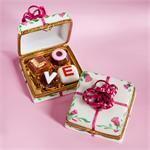 Limoges Birthday Boxes for every occasion. 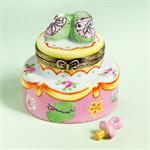 For the little ones, you may want to have a look at the Limoges First Birthday Boxes : our Limoges First Happy Birthday Cake Box with a blue or pink balloon with the number one, our Limoges First Happy Birthday Box with a white rabbit, or brand new this year and exclusive to us our Limoges Birthday cake box with baby shoes and a loose Limoges porcelain pacifier. 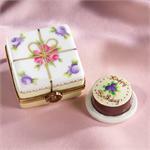 This Limoges box makes a great gift for a Limoges Baby Shower Box. 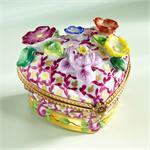 If you are looking for a Limoges birthday box for a sixteen year old, you do not want to miss our Limoges French hand painted Sweet Sixteen Birthday Cake box, a great Limoges box at an affordable price. 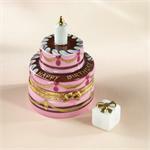 For that special birthday, we would like to suggest our exclusive Limoges Birthday Cake with 3 balloons , if you think your birthday may be in the islands or by the sea, our Limoges Tropical Birthday Box with fish and 3 candles in bright colors to match the sunny weather. 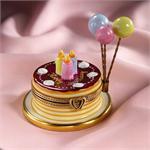 For an elegant and more traditional choice, please take a look at our Limoges Birthday Cake Boxes in a Dome: our Limoges Birthday Cake with roses and candles box or our Limoges Birthday Box with Balloons. 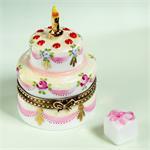 We would also like to recommend our all times classic, for all ages and occasions: our Limoges Birthday Cake Box in a Gift Box with a beautiful décor of roses and a ribbon , almost like a real cake from a fancy pastry shop. 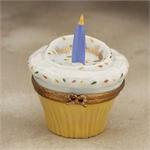 Our Limoges Birthday Boxes section would not be complete without mentioning our Limoges Cupcakes Birthday Boxes, part of our more extensive Limoges Cupcakes Boxes Collection. 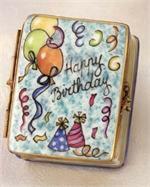 Limoges BIrthday Cake Box with Gift.